Want to know the best tips for exploring the Greek island of Syros? What better way than to ask the locals. We chat with local hotelier Elspeth of Good Life Greece, an eco-hotel specialising in simple luxury and sustainable living in Poseidonia, Syros. Think old stone houses surrounded by olive groves, local wine, and long leisurely sunset dinners with new friends. Read on to discover Elspeth’s island of sirens, silence and sage . . .
We live in Poseidonia, a village on the west side of the island and, besides Ano Syros, the earliest populated area. With good reason we discovered after we bought here – it is wind protected. We moved here from Athens originally to set up a family holiday place as we are scattered around the world. But the land, the views, the potential inspired us to develop a self-sufficient mini village that could go off the grid for water, power and food production. It was a leap – but there was one huge advantage. As the two farmsteads and vineyards were over 300 years old, they had deep underground water ‘sternas’ The sternas were out of use when mains water came, but they are carved out of the marble substrata, around 6 metres deep and 5 x 6 metres. They fill from roofs and paths. They have been repaired and underground piping is in place to provide all drinking and house water supplies for 6 villas, up to 28 people. The final stage of water purification and pumping is tabled for 2020 when the last villa will be completed. The grey and brown water is already being cleaned organically in two sets of above ground tanks and fed into the gardens, grapes, olives and vegetables. We now use less electricity than we create from our photovoltaics, by 2020/22 we will have batteries to contain our own power so we are able to go off grid. All our renovations and buildings have been carried out in marble with maximum earthquake protection and insulation to a high standard. Our builder tells us we can have a 100-year guarantee. Hmm. So that is how we started, but the high front-end costs of the project required we monetise the villas. That proved to be far less of a problem than we originally thought. Our company has hotels in Athens, so we know the business. What we didn’t expect is that the guests attracted to The Good Life have a lot in common. They have all been highly educated, all ages with an emphasis on families with young children and retirees. They are ecologically aware and almost all read the Guardian (we know because the Guardian wrote an article about us and 80% of our guests seem to have found us through it). When we found we enjoyed the company of our guests, and they enjoyed each others company, we set up weekly Wine and Greek food nights. These evenings go on into the early hours, too much wine is drunk and everyone has an amazing time. It is the only marketing we do. But we also have a central communal BBQ area where people congregate. We often take Greek wines down and share a sundowner with the guests as they cook. This area is by the Veggie Patch, which guests can help themselves to. I often help them pick and put together dishes with the right herbs. Impromptu Greek cooking classes happen regularly. Our guests seem to like yoga, so about three times a week I have a yoga teacher come in and run an early morning class on the roof, again no charge. The Good Life tries to make guests feel like treasured friends, not units of value. My husband takes people around the island, shopping etc daily. The result is by year 3 of operation, we already have a significant return/referral business building. What do you love about Syros? It’s not a typical tourist island. There are no cruise ships, no large hotels, no tour operators and no crowded beaches. What we do have is no different from most of the lovely Cycladic islands, that is stunning blue flag beaches (all Syros beaches are Blue Flag), fabulous beach tavernas, rocky wild walking landscapes, interesting places to explore and the old-fashioned Greek welcome. In particular, we also have a history from the 17th Century reflected in the town of Ermoupoli. We are the cultural centre of the Cyclades, with 23 different arts festivals in summer and sporting events all year. We are the legislative and bureaucratic centre of the Cyclades and Dodecanese – so our town caters for a large professional population with corresponding services and shops. We are the only island with a full hospital in the region. Syros is a successful independent island and doesn’t need tourism. The tourists we have are usually Athenians. This makes it a fabulous place to live, all the advantages of a Greek island with none of the disadvantages. What should everyone do at least once on Syros? Visit the Apollon Theatre, a mini La Scala that hosts to international music events all summer. Anyone can walk in and admire it during the day. What do I miss most about Syros when you’re not there? The silence. Here, at The Good Life, we are in a protected rural area overlooking the water. No more buildings can be put up so we only have olive groves, grapes and grazing land between ourselves and the water. The little lane leading up to us serves few people, we rarely hear any traffic. Favourite place for a trip? St Micheali – at the top of the island has an amazing restaurant with a menu straight out of a New York bistro, and 360° views of the ocean. Before lunch, you can walk the headlands in lovely little paths with nothing but water all around you. 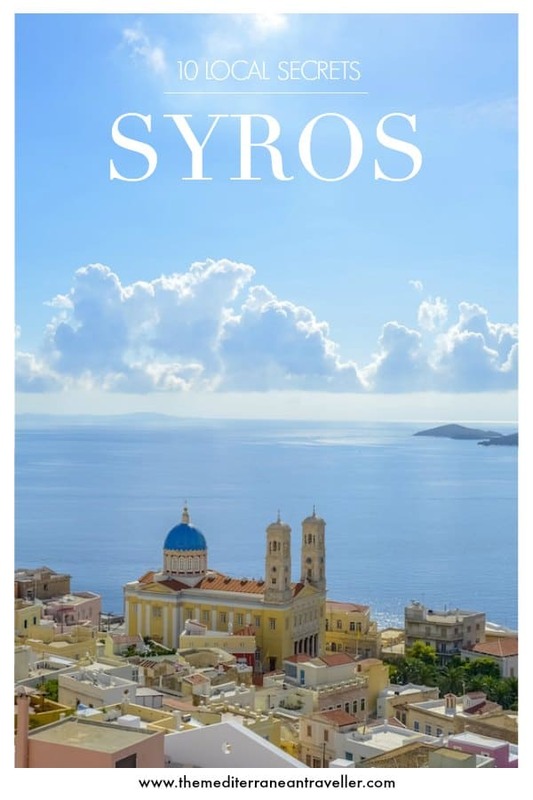 Tell us a cool fact about Syros? There is a story – hard to pin down archaeologically – that Syros is the place the Sirens came from, trying to lure sailors to their doom on the rocks with their enchanting singing. Homer refers to Syros and tells the story. It may be a myth, however, the name Syros comes from Sirens. Syros smells like . . . Warm lavender, rosemary and sage with sea salts mingled. Syros sounds like . . .
Water lapping, goats and sheep bleating (at least where we live). Beautiful Sunday afternoon at The Good Life! Spend a weekend here! The thing I wish tourists knew about Syros is . . .
Syros is open all year. In fact its better in the autumn, winter and early spring. That’s because there are no Athenians here then (many have their summer houses here). The roads are quiet and the beaches, still warm and lovely for swimming are empty. The great chefs that have seaside restaurants in the summer open their winter restaurants in Ermoupoli for the winter. Menus change to winter food, they fill up wonderful old neo-classical houses in town with locals and visiting lawyers, etc., and you feel you are in a French or Italian town. At the Good Life, we made sure we had great heating systems and entertainment for the low season, so we are encouraging visitors year-round. Is there a local charity you support? Last year a fund was set up out of the UK to galvanise the Cycladic stakeholders into protecting the environment in the region with dollar-for-dollar support and staffing to select projects and manage financing. They have already done some great work, so we collect for them and support their events: visit the Cyclades Preservation Fund for more info. 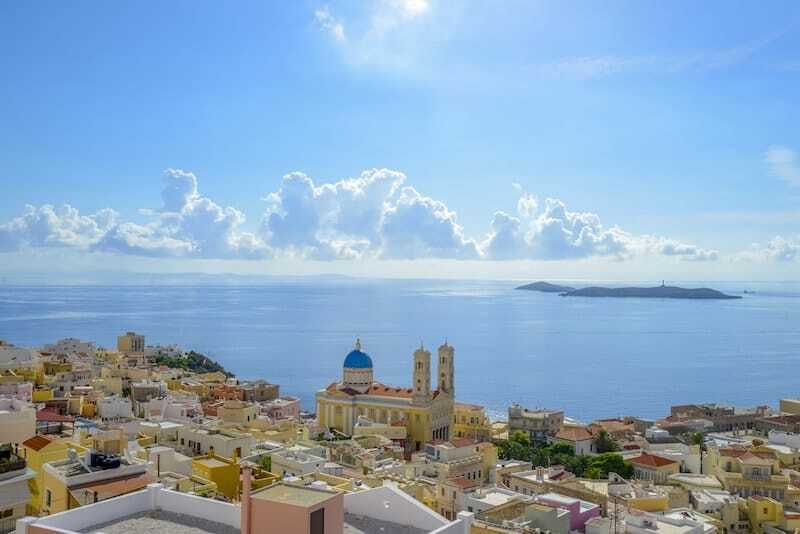 When’s the best time to visit Syros? Thanks to Elspeth for sharing her side of Syros. The Good Life looks seriously dreamy, I heartily recommend checking it out if you’re into responsible travel and/or want to get off the beaten path in Greece this year. As a Guardian-reading, yoga-practising, wine-and-BBQ-lover it certainly ticks all my boxes and I can’t wait to visit. You can also find The Good Life on Facebook, Twitter and Instagram.